Nanotechnologies: Are We All Nanogrub Guinea Pigs? - Basta ! Nanotechnologies : Are We All Nanogrub Guinea Pigs ? 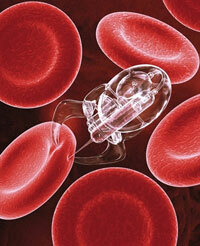 Nanotechnologies: Are We All Nanogrub Guinea Pigs? After GMO, nanotechnologies come uninvited onto our plates: nanofoods, treated with nanopesticides and contained in nanopackaging, are on the rise. At stake: colossal financial profits for manufacturers and environmental and health risks impossible to evaluate today. All in a complete and unbelievable absence of rules and controls. This article was initially published in french here. Smart foods that adapt to the consumer’s tastes, clothing that repels water, materials that repair themselves, "intelligent dust" that discreetly records conversations ... Welcome to the nanoworld! A universe where science tinkers with particles invisible to the microscope and piles up atoms on the scale of a nanometer, that is a billionth of a meter . We are promised nanotechnologies will be the foundation of a third industrial revolution during the twenty-first century. A revolution that also goes by way of our plates. For these nanoparticles are already present in industrial food, agricultural pesticides, food packaging, storage containers ... with neither control nor labeling. Particles which, because of their minuscule size, cross biological barriers and can circulate throughout the entire organism: skin, tissues, the brain ... So, are you ready for "atomically modified" food, with still unknown effects? At least 106 nanofoods have already been commercialized. It’s difficult to keep track of existing nanofoods. 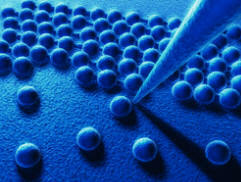 The manufacturers understand very well that the uncertainties that surround nanoparticles today may frighten consumers. They do not communicate clearly about their utilization. According to the NGO, Friends of the Earth, today the entire food chain is "contaminated." Its report, "From the Laboratory to Our Plates: Nanotechnologies in Food and Agriculture," draws up a list of 106 nanofood food products from "fortified" fruit juice to vitamin supplements, by way of "nanotea." The French Agency for Environmental and Work Health Security (Afsset) counts 2,000 manufactured nanoparticles already commercialized in all sectors and over 600 consumer products involving them. Although these numbers are not easily verified in the absence of traceability, estimates situate the nanofood market at over $5 billion for 2005, with forecasts of $20 billion for 2010. Consulting group Helmut Kaiser forecasts that recourse to nanotechnologies between now and 2015 will involve 40 percent of manufactured foodstuffs. "A Comfort Technology for Rich Countries"
Aluminum silicate to prevent clumping in powdered food, ketchup thickened with silicon dioxide, vinaigrettes whitened with titanium oxide ... Nanofoods, according to their adherents, would bring us major culinary advances: chocolate and ice cream without lipids or sugar that keep the same taste as the original, an oil (Shemen Industries) that inhibits cholesterol entry into the bloodstream, a food substitute (Nanotrim from Nanonutra) that burns fat. 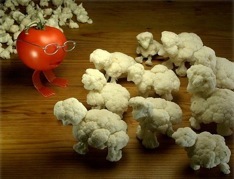 Or the possibility of changing a food’s tastes according to our desires. Manufacturers such as Nestl seek to design the "nanofoods of the future." Food-processing giant Kraft Foods (United States) is one of these pioneers. In 2000, it financed a consortium of 15 universities and research laboratories, Nanotek, to design "smart" and personalized food, food that might contain hundreds of nanocapsules, filled with different flavors, nutrients and colors. A microwave oven could activate, according to the wave frequency, such and such a capsule, according to the consumer’s desire - a kind of interactive food that may even transform itself if a person is allergic to an ingredient or release a dose of nutritional supplement if it detects deficiencies. Kraft Foods, the designer of this project, owns the chocolate brands Milka, Cte dOr, Toblerone, Suchard, and coffee brands Carte Noir, GrandMre, Jacques Vabre and Maxwell. Imagine tomorrow, your pink-colored banana-flavored coffee that delivers your daily dose of vitamin C ... Or chocolate that releases carrot aromas as it treats your hangover. Terrific, no? Why this deployment of technology? "With respect to food, we don’t understand the point," explains Rose Frayssinet, from the NGO, Friends of the Earth. "It’s like textile applications: what’s the point of ’no-odor’ socks with nanosilver? The nanoparticles will wash away in the water after four washes and will eat microbes all the way to the purification plant. In view of the cost, what is the social utility of all that? These are technologies for the comfort of the rich." Moving Towards a New Health Scandal? "In the case of GMOs, we’ve forced Monsanto to make public the partial studies of toxicity that had been concealed from the public. Similar studies do not exist on nanoparticles’ harmfulness," the Citizen Sciences Foundation emphasizes. "And those who sound the alarm have been deterred by every means (lawsuits) from breaking with the official propaganda." Rose Frayssinet believes that we are confronted with an even greater risk than with GMOs. "GMOs are a sector, while nanotechnologies involve every sector. The risks are that much more difficult to analyze. We can’t get a global vision of the implications." It is difficult, in fact, to control nanoparticles’ behavior. They don’t respond to the laws of classic physics, but to those of quantum mechanics. Building particles, atom by atom, manipulating material at a molecular level is to enter into a world of radical uncertainty. The particles’ properties, such as their toxicity or their biological persistence, vary with their size. De facto, present knowledge on the toxic effects of manufactured nanoparticles is very limited. Nano-Particles: the Asbestos of the Twenty-First Century? A British study demonstrates the existence of an indirect effect of nanoparticles that damages DNA "from a distance" . INSERM Director of Research Marie-Claude Jaurand fingers carbon nanotubes, an ultra-resistant material used in industry, for their effects "similar to those of asbestos," involving the production of DNA lesions and the formation of chromosomal abnormalities. In the face of these risks, what are the competent authorities doing? Not much. The regulatory authorities are ill-adapted. Ministries and health agencies are completely outmoded and outdated (the most recent documents published on the Health Ministry site date to 2007). Risk evaluation must be completely reconsidered. The systems of authorization for commercialization are based on products’ chemical composition. For nanoparticles, that’s inadequate, because their effects also depend on the spatial organization of atomic elements and on their size. A non-toxic element may become toxic at the nanometric scale. "Titanium dioxide and silver oxides don’t have the same properties at the nanometric and macroscopic levels," explains Rose Frayssinet. "They don’t have the same properties when they measure 20 nanos as they do when they measure 60 nanos. To study the risks, therefore, it would be necessary to conduct studies at every level." But that’s expensive. And the tools are lacking. "According to European laws, once a foodstuff is modified, a study to prove its innocuousness is obligatory. But no one knows how to do it. Just a year ago, there was no really reliable filter to separate out nanoparticles. Not counting that, with the very long lead times for studies, the results arrive after commercialization. They ask manufacturers to work in white rooms, with spacesuits. And right afterwards, they put products on the market. It’s absurd!" With respect to production and commercialization, manufacturers submit to the European REACH directive. Yet that is inadequate. Only those chemical substances produced in quantities in excess of one ton per year are subject to REACH. Given the size of nanoparticles, that production quantity is not always attained. And, at present, no labeling requirement exists, even though the European Parliament is beginning to look into this question. The State Finances Research Without Worrying About the Consequences. "No data, no market." That’s the position taken up by numerous environmental associations, which hope to be joined by employee unions. They demand a moratorium on nanoproducts and appropriate risk-evaluation procedures. NGOs also hope to debate the social utility of nanotechnologies, especially in the food industry. In 2009, the French government launched the Nano-Innov plan, which aims to place France among the most advanced countries in nanosciences, by encouraging basic research to work "with companies to develop technologies, apply for patents, create products." Seventy million Euros were devoted to this project last year. In parallel, no funds have been dedicated to toxicological studies or to health and environmental impacts. Minister of Higher Education and Research Valérie Pcresse emphasized the excellence of national nanotechnology research (France is fifth-ranking globally ) at the launch of this plan, but was upset that 290 patents only had been applied for in 2005, which represents less than 2 percent of global patents. For the sector is a big earner. The American National Science Foundation (NSF) evaluates the nanotechnolgy market in 2015 at a trillion dollars. According to the Citizen Sciences Foundation, investments in research and development have increased virtually tenfold between 1997 and 2003 (3.5 billion Euros), with growth forecast at 40 percent per year. "Researchers often tell us: all we have to do is say ’nanotachnologies’ in our plans to have the money to conduct the research," comments Rose Frayssinet. Pharmaceutical and agribusiness multinationals are lined up to manufacture even more nanofoods. At the opposite end of the spectrum from locally organized and ecologically sustainable food systems, a new food revolution is underway based on several private firms’ monopolization of the constitutive elements of matter and our food. As with fast food, here we are, transformed into guinea pigs for nanogrub, with the state’s silent complicity. Size of the atom: 1 tenth of a nanometer; DNA: 10 nanometers: proteins: 20 nanometers. "Some nanoparticles may cross and/or alter plasma, nucleus, and mitochondrial membranes, induce hydrolipid peroxidation and the generation of reactive types of oxygen, itself the source of oxidative stress that can alter proteins and DNA (Hong 200657; Xia 200658; Beck-Speier 200559; Lewinski et al. 200860; Stone 200761; Hussain et al., 200562). Source: Nanotechnologies et nanoparticules dans lalimentation humaine et animale [Nanotechnologies and nanoparticles in human and animal food] - AFSSA. "Nanoparticles can cause DNA damage across a cellular barrier," Gevdeep Bhabra et al., Nature Nanotechnology (on line, 5 November 2009). With 3,526 publications in 2006, or 5.6 percent of global publications.